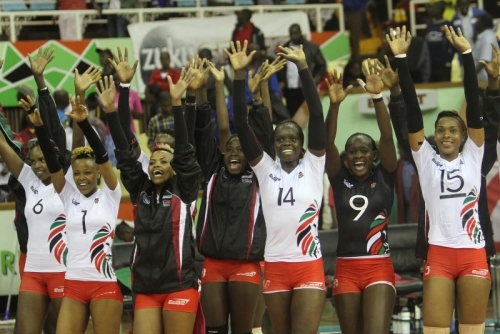 For a record 9th time, the Kenya women’s volleyball team won the African Volleyball championships and in the process earned a place in the FIVB world cup to be held in Japan in November. And Kenya did it in style. Not only did they win every match, but they also won every set. During the group matches, Kenya ploughed through Mauritius, Botswana and Algeria with identical scores of 3-0. In the semi-finals, Kenya recorded an impressive 3-0 win over Cameroon. This is the same Cameroon team that had beaten Kenya in the semi-finals of 2011 All Africa games and forced Kenya to settle for bronze. In the finals, they beat Algeria 3-0. The fact that Kenya beat Algeria twice without losing a set is impressive Algeria have won the All Africa games gold medal twice in a row (2007 and 2011) and have beaten Kenya on several occasions over the past few years. “I think that Kenya is too much for us now, I was missing two dependable players but still we cannot dislodge them for at least the next one year,” Algeria’s Italian coach François Salvagni said to the Daily Nation. Also impressive is the fact Kenya won the most individual awards: Everylne Makuto was voted the tournament’s most valuable player (MVP), Janet Wanja (best setter), Ruth Jepngetich (best blocker), and Elizabeth Wanyama (best libero). “We fought hard for all this, God is great,” Makuto said. Kenya have now been African champions an incredible 9 times. The closest challengers are Egypt and Tunisia who have won 3 times each. To put it plainly, at continental level, the Kenya women’s volleyball team are Kenya’s best performing team whether at club or national level. Kenya were the defending champions having won in 2011 and 2013. They will now be gunning to regain the All Africa games gold medal which they last won in 1999. Algeria have won the last two editions. African continental competitions such as the All African games have featured volleyball since the 1960s. Kenya had been a non-factor in continental volleyball. That is until 1987. Before a partisan Kenyan crowd at Kasarani, Kenya shocked everyone by unexpectedly reaching the finals. And in the finals, Kenya put on a valiant effort against Egypt but lost 1-3. Each set was closely contested, often going to tie breakers. That Kenya squad with players like Margaret Indakhala, Ann Wekhomba, Doris Wefwafwa, Lucy Fataki Kamweru, Nereah Ouma, Njeri Onyango, Emily Kusimba and Truphosa Lai are considered the pioneers of Kenya women’s volleyball. Though Kenya lost in the final, most observers saw a bright future for Kenya. They were vindicated when Kenya avenged their loss by beating Egypt in Cairo in 1991 to win the 5th All Africa games final. It was a momentous year for Kenya as they won both the African championships and the All Africa games gold medal. The indefatigable Margaret Indakhala amazingly still players volleyball actively. In 2011, she won a bronze medal at the All Africa games beach volleyball contest when she paired with Dorcas Ndasaba who is also a veteran of the Kenya national team. In the years between 1991 and 2003, Egypt was Kenya’s primary rival both at national level and at club level. Egypt were African champions in 1976, 1989 and 2003. But whereas Egypt has fallen by the wayside, Kenya has remained consistent. The decade of the 1990s was the most successful period for Kenya. During this period, they won all the All Africa games contests (1991, 1995 and 1999). They also won the African championships 4 times in a row (1991, 1993, 1995 and 1997). This was the period of players like Violet Baraza, Roselidah Obunaga, Mercy Wesutila, Gladys Nasikanda, Mary Ouko, Mildred Odwako and Abigail Tarus among others. Violet Baraza put on impressive performances that saw her become the first Kenyan woman to play professional volleyball in Europe. She played in Greece and Romania. At the start of the new millenium, Kenya started to face strong challenges from the North Africa teams. Initially it was Egypt who wrested the African title from Kenya in 2003. Then Algeria who won in 2009. However Kenya has won 5 out of 8 African titles since the turn of the century. During this period, players like Jane Wacu and Braxcides Agala have produced superb performances that have seen them rewarded with professional contracts in Europe. Both play for French second tier side Chamalieres. This entry was posted in Kenya Sports news and commentary and tagged kenya womens volleyball. Bookmark the permalink. Wow nice article. I was wondering if you could help edit the malkia strikers wikipedia page especially the history part which you seem to be good at. It will be greatly appreciated. I have edited a few things there…..